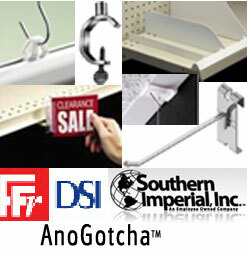 Quality Fixture & Display Products.Low Prices. Whether you are a supermarket, c-store, retail operation, pharmacy, or foodservice operation, there are hundreds and hundreds of fixture & display options available to you. Joshen understands how confusing the options are between all the clips, pegs, and sign holders that are available on the market today. Joshen has all the fixture & display supply products that you need from the leading manufacturers that you demand. Some of these small clips and pegs are procured by Joshen in master cases and shipped to you in inner packs so that you don't have excess inventory that often times is not available for resets as they get lost in your backroom storage area. Loss prevention security products-lanyards, cables, etc. Joshen is The Total Package for your Fixture & Display Needs! Contact us today so that we may assist you in identifying the supply products that you need to merchandise your items and protect & secure your retail items. Are your store personnel having difficulty ordering the correct supply products? With all the variety of fixture & display supply products, it can be quite confusing. Look to Joshen's b2b order processing on-line solutions, where your stores can order supply products complete with images so they know the exact supply products they are ordering; increasing efficiency in your stores.